One day at our local store a bright orange fruits caught my attention. I went by it once, than came back to the produce section to pick something else and looked at it again, then before I went to the register I came back to the produce section and couldn't resist to put in my basket a couple of kumquat packs. They were so sunny, so cheerful, and so happy looking at me, how could I had left without them?! I came home, had a few kumquats with all their flavor bursting up to my brain. Then I had a few more, then... well, by the end of the day we finished it. Needless to say that the very next morning I went back to the store and headed straight to the section, where the little sunshine fruits were sitting. I bought a few more boxes with a single thought: "I need to preserve some of it". I didn't know how and what I was going to make, I just wanted a jar of this fantastic flavor to be preserved. P.S. It looks like we will be moving back to Washington State in July. And we also have two graduations: our teenager is graduating from high school in May, and my husband is graduating from the residency in June. With all that said, my posts will be sporadic for the time being, until we move and settle somewhere. I also may not be visiting your lovely blogs as often as I'd like to. But I think of you all often. I love kumquats - they grow well here. 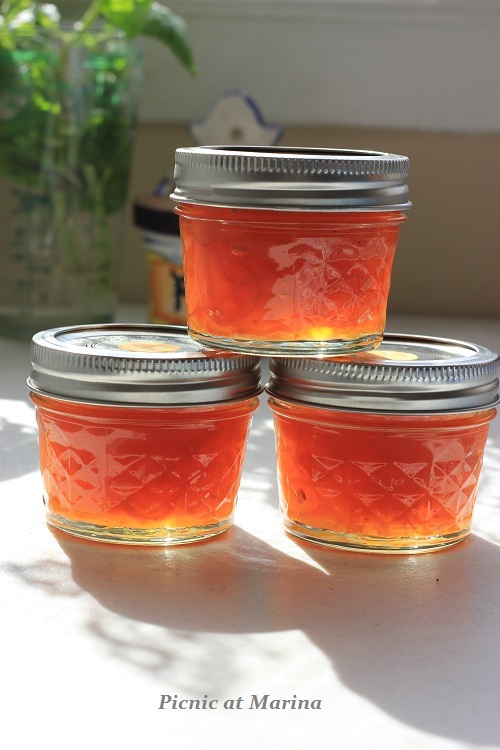 I make kumquat marmalade jelly quite often. Because you're going to strain it you don't have to worry about how to fruit is cut - a big bonus in my view. I like the flavour of cumquats-we don't get them a lot here at the stores but often my mother will receive some from her friend's trees! Oh that looks beautiful. I don't know that I've ever had a kumquat, but they sound delicious! 've never tired kumquat, Marina, but now you've piqued my curiosity, I'll ve on the look out for them. That looks absolutely delish--and in time for the sunny spring season, too! Thanks, Marina! 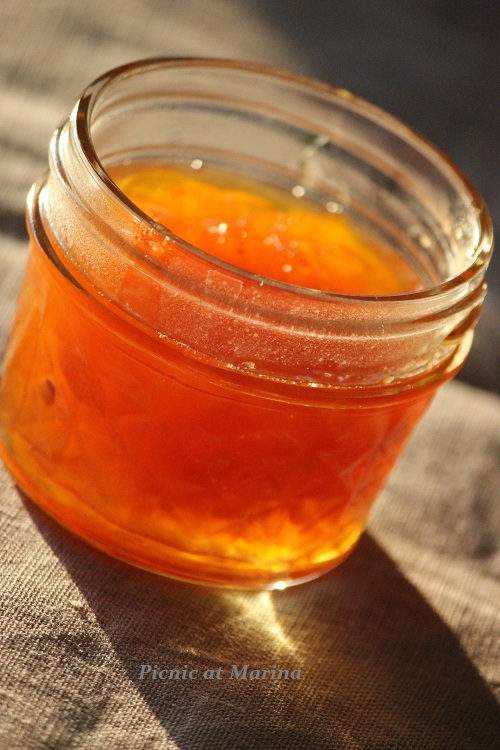 I've never had kumquat jam - something I should remedy, don't you think? ;-) Although two hours worth of slicing is close to my limit! Really excellent stuff - thanks. Marinochka, I love your jam, I am crazy about it, I would love to try it now!!! The color is so amazing and I bet it's so delicious. We should exchange out jams-)) I have all sorts of jams but one made from cumquats-)) Good luck to you with your move! Hugs and kisses from your friend. Beautiful color. Would a few pulses in the food processor work? Congrats to the graduates and all the best with your move. I can't believe I missed this post! What a lovely post. What Beautiful Jam. I have never tried a kumquat. Will be on the look out for some in the grocery. One look at this jam and all your efforts look worth it. We don't have kumquats in this part of the world and I am really intrigued. It looks beautiful indeed.. I read and tried to comment on your jam earlier but I have been having problems with comments not going through. Thought I would try again to tell you how beautiful you jam looks...like golden jewel. That jam looks divine! Good luck during this busy time !! I hope things go smoothly and you settle in easily! Your kumquat jam look so pretty...and yes so much work cutting them into small pieces...last year I got to make some preserve as well, and still using the preserves. 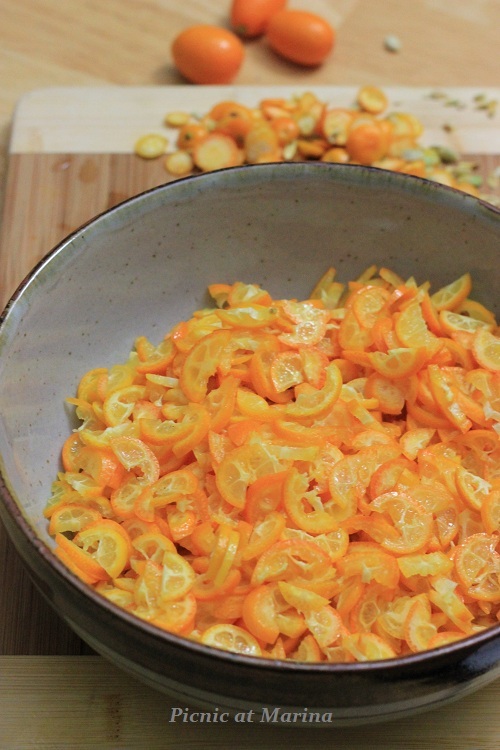 KUMQUAT is something I have never tried, but you are tempting me to do so. Your jam looks so perfect. 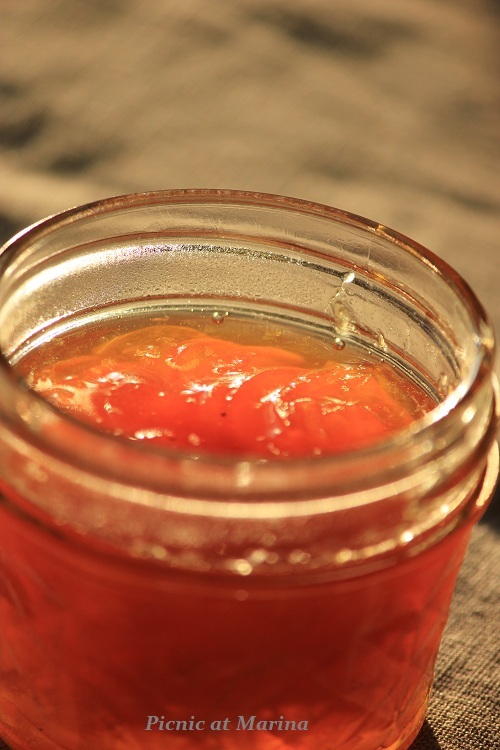 I am really impressed by the yummilicious picture….I think, I can lick this jam the whole day and day after day…. Wow, Marina! You got your chores cut out for you...yet, another move, back to Washington state. Hopefully this move back again will work out better for you and your family!